Moisten Before Use - "Still No Reply"
Moisten Before Use is a sound exploration/manipulation project lead by Clive Richards, whose projects we've reviewed also include All A Stagger, Erixma, and Switch Off Option. 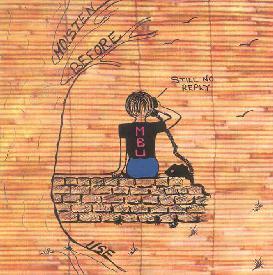 This CD reissue of the 1989 Moisten Before Use cassette, Still No Reply, was their third release, preceding Awkwardnisity (their fifth), which Scott reviewed in AI #22. After an introductory efx'd voice narration the album commences with "Breathing Out", a sound exploration piece with ambience, drones, bells, percussion and glissando guitar. The varied layers of sound evolve very nicely over 6 minutes. There's a slight melodic feel and the gliss guitar gives it all a very cool spacey feel. "Amen" is similar but more in the avant-garde realm, as is most of the album, focusing on the gradual development of a limited theme. Vocals in the form of chants and other types of "voicings" are a key element and provide much of the character of the music. I enjoyed this track for the way it straddles the line between peaceful ambience and darker atmospherics. "Possessed By The Belief" makes similar use of voices to create a chaotic but fun collage track. "Let Sleeping Ships Lie" does an impressive job of using bells, percussion, miscellaneous objects and tape manipulation to create a piece that is sparse but interesting. It's like a mini bell symphony, with each bang on a bell producing an extended ring of varying pitch and tone. "Could Have Talked To God" is my hand down favorite track of the set, being a carnival-of-the-avant-garde work that combines quirky rhythms, oddball voices, all manner of bells, objects and percussion, and a slowly building rock groove that eventually becomes an actual song. A creatively constructed 11 minutes of fanciful fun. "Drive" is a short percussion dominated tune that establishes a groove, but also has a buzzsaw synth line wailing in the background. "Reptiles" is equally percussion heavy, but with more of a tribal style, and is combined with Residents-like voices and more of the whimsy that characterizes the best moments on the album. In summary, fans of sound and tape manipulation works will find much to enjoy in Moisten Before Use's adventures. But high browed arty types should stay away because these guys aren't adverse to having a little fun. Contact via snail mail c/o Fragment Music; PO Box 4063; Brentwood; Essex; CM14 4WH; England.